BMG’s portfolio of Fenner power transmission components includes a range of high-strength friction transmission belts that offer longer service life, higher drive efficiency and reduced downtime compared with conventional V-belts. Fenner PowerTwist Drive V-belts, which are manufactured from a high-strength polyurethane elastomer, reinforced with multiple plies of polyester fabric, offer excellent resistance to abrasion, oils and greases, water and steam, industrial solvents and chemicals. “These flexible V-belts are the ideal solution for permanent replacement and fitment into inaccessible locations. They can be custom-sized for each sheave groove, reducing wear and providing a perfect matched set of belts when mounted on a drive. They combine extremely high-strength with low-stretch and have the same power ratings as conventional V-belts. 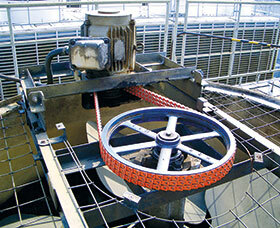 The elasticity of woven polyurethane fabric enables these belts to be stretched over a pulley drive without any damage. Also in Fenner’s range of transmission belts are Fenner Power Plus heavy duty drive belts, which meet stringent international quality specifications, as well as the highest standards for static conductivity (ISO 1813 standards). BMG is celebrating Fenner’s 90th year of business in South Africa this year. New research by SKF could make hybrid bearings more cost-effective and reliable, paving the way for their use in a wider range of applications. Nord drivesystems encompass optimum drive configurations to ensure optimum performance of mechanical speed control for specific applications in almost every industry.